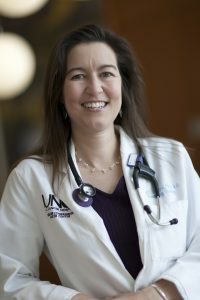 Kristy Richards, PhD, MD, who was on our faculty of medicine and a member of UNC Lineberger Comprehensive Cancer Center from 2007-2015, passed away from breast cancer surrounded by her family and friends on March 30, 2019. Richards was known for her excellence in both the clinic and the laboratory. Following her training in genetics under David Botstein at Stanford, she was attracted to medicine and became one of the many superb oncologists trained in Ki Hong’s program at MD Anderson Cancer Center. At UNC, she published widely on her research investigating diffuse large B-cell lymphoma, a subtype of non-Hodgkin lymphoma that is most common in both dogs and people. She also performed comparative oncology research with her colleagues at the NC State College of Veterinary, which generated insights that benefited both humans and dogs with these diseases. Her work with human lymphoma delved into the genetics of response and resistance to therapy. Richards was an exceptional oncologist and caring physician served who countless patients and their families. Richards moved to New York in 2015, where she was an associate professor in the department of biomedical sciences in the Cornell College of Veterinary Medicine in Ithaca and in the hematology/medical oncology division of Weill Cornell Medicine in New York City at the time of her death. She is remembered by her UNC colleagues for being a devoted and caring physician as well as a highly accomplished geneticist. “I still remember the first moment I met Kristy in the atrium of Lineberger her first week at UNC. We became fast friends and great colleagues. I truly feel that my life has been enriched for knowing her” said Katie Hoadley, PhD, assistant professor of Genetics and member of UNC Lineberger. “Kristy was a wonderful person and full of life. Her eternal optimism and cheery disposition were unsurpassable. She was immensely loved by many friends, colleagues, and family. She will be greatly missed,” said Blossom Damania, PhD, vice dean of research at the UNC School of Medicine and a member of UNC Lineberger. In lieu of flowers, Richards asked that her friends contribute to CLEAR, a group she worked with and that helped fund her research prior to her lab receiving big grant funding.